Polarized connectors have a place in the hearts of many modelers as they make it impossible to destroy their expensive electronics and batteries by plugging them in Backwards. However, they have been lacking a connector capable of extremely high currents, constantly having to increase their voltage to maintain amperage levels. But what do you do when you're maxed out on voltage and your setup requires more amperage than battery connectors on the market will handle? what if you don't want to or can't increase your voltage due to size constraints or competition rules? the answer is simple, you go green. These new Castle Creations polarized connectors will handle up to 200 amps of continuous current without breaking a sweat at any voltage level used in R/C applications. These are the highest rated polarized connector on the market. Not only that, but they're user friendly too! We've added ridges to the housing making them easier to grip, they accept up to massive 6 AWG Wire, and We've marked them for "battery" and "ESC" for easy reference. Batteries and ESCs aren't the only things they're Useful for though. Use them on your charger leads, parallel and series harnesses, high current amp/watt meters, and anything else that needs Super high current. They're what "going green" should really mean! 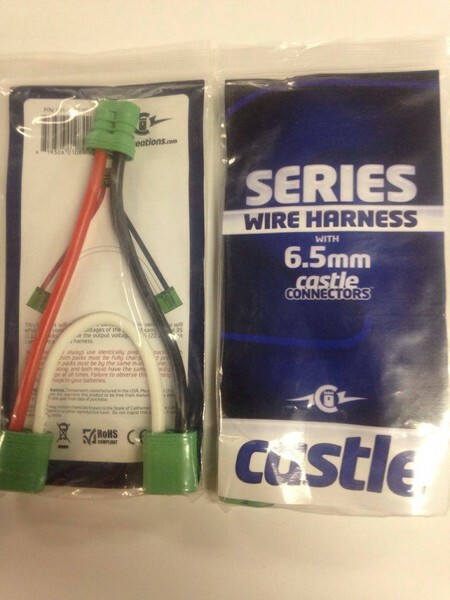 Note: Both battery packs used with the harness must be identically prepared, fully charged and properly balanced. Both must be the same brand, same C-rating, same capacity and level of charge. Failure to observe this warning may result in damage to batteries and/or ESC. Shipping Charges: Our standard shipping charge for this item is a flat $5.00 charge. This product was added to our catalog on 12/12/2016.